Helen Loewen Warkentin was born November 25, 1887 at Hoffnungsfeld (near Winkler, Manitoba), to Rev. John Warkentin and Sarah Loewen Warkentin. She was a sister to Susanna Warkentin, who later married Rev. H.S. Voth. She was converted at the age of fifteen and was baptized and accepted into the Winkler Mennonite Brethren Church on July 17, 1904. Warkentin attended the Normal School at Morden and then taught school in various Manitoba public schools. She spent one year at the Moody Bible Institute in Chicago. In 1919, she was ordained as a missionary by Rev. David Dyck. In 1920, she went to Deverakonda, India, where she was a teacher and the principal at a boarding school, as well as dietitian, and superviser of gardening, well digging, and carpentry. She spent four terms in India. In 1957, Miss Warkentin finished her last term and went home to Winkler, where she lived with her youngest sister Tien. Helen L. Warkentin died June 25, 1975, at the age of 87. Some of Warkentin’s original papers and her diary were donated in 1986 by Bernard and Sara Klippenstein. In 1987, Esther Enns (niece), Winkler, donated photographs and personal papers. Julianna Enns of Winnipeg donated books, personal papers, scrapbooks, and a photo album in 1995. Accession numbers are 1986–52, 1986–53, 1987–5, 1995–43, 2003-040. Finding aid for photographs: NP18–1, NP18–2. Updated by Kate Woltmann, October 2013. Index, Obituaries, accession information and short narrative. Correspondence. – 1937, 1946, 1957, 1959, 1960-1965, 1968, 1971-1972, 1974-1975, 1983-1984. Travel documents, passport, wedding invitations, course notes, personal notes, farewell addresses, poetry, correspondence, missionary credentials, events & celebrations, various other documents, official “Act respecting Aliens and Naturalization” certificate (1883). – 1883, 1912, 1916-1921, 1929, 1934-1938, 1948-1949, 1957-1958, 1960, 1963, 1968-1969, 1970-1976. 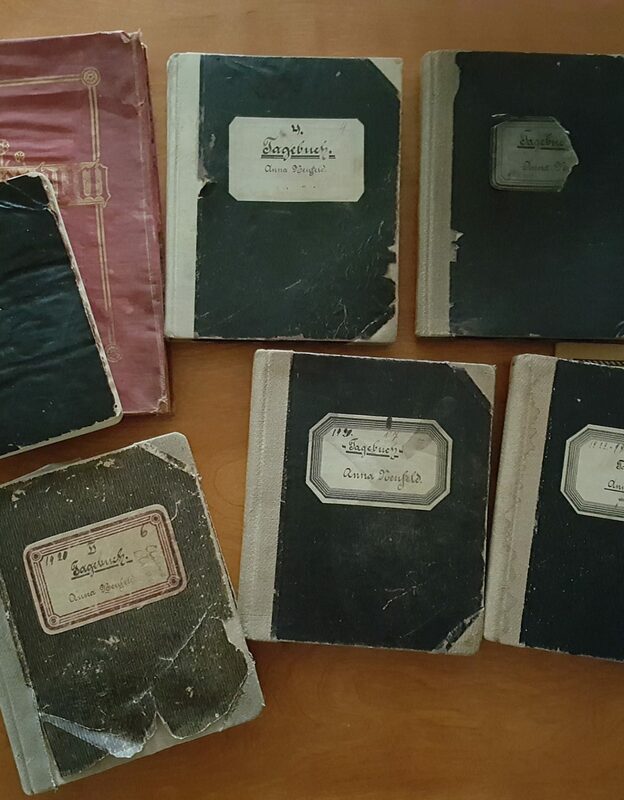 Newspaper clippings, Missions Album of the Mennonite Brethren (1914), Foreign Missions booklet (1946), Indian worship booklets, homemade verse booklet, Asian travel booklet, German New Testament (1910), “Festival Bells” booklet(1912). – 1910-1967. Winkler MB Church Sunday School Christmas handkerchief. – 1911. Helen Warkentin’s pocket notebooks, newspaper clippings, obituaries, invitation to Helen’s 84th birthday, proceedings at Helen’s 84th birthday celebration, church dedication program of Gonakole Village in Devarakonda Field. – [195?]-1972. Teacher Certificates and Missionary Certificate. – 1912-1915, 1938. Blueprints and proposal pamphlet for the Hermon MB Church at Sivannaguda Village, Deverkonda. -- . Diary of Helen Warkentin. -- 1914-1929. typed by Lois Wedel 2014. J.H.Lohrenz “Foreign Missions India” booklets, paper presented by J.H. Lohrenz, “The Mennonite Brethren Church Program in India.” – 1948, 1960. School writing project, various writing projects. – [191? ], [19—]. Correspondence & postcards, Christian choruses in Telugu, Aiken Institute information booklet. – [191?]-[197?]. Birth Certificate, Missions-Fest ribbons (1911, 1919), correspondence, Canadian Pacific Wireless Press info sheet. – 1911, 1916, 1919-1920, 1926-1929. Correspondence, various programs/bulletins, pensioners registration certificate, Newspaper clippings. – 1957-1958, 1962, 1967, 1972-1976, 1985-1986. Travel booklets. – [192? ], 1937, 1970. Music book by Y. John Elisha (1931), “Andhra Christian Lyrics and Hymns” (1956), Indian worship book. – [192? ], 1931, 1956. Helen Loewen Warkentin work book and study notes. – [192?]. “Mother Helen Leena Warkentin of Devarakonda,” story of Helen by A.S. Joshua. – [197?]. Helen Loewen Warkentin scrap book. – 1920-[197?]. “A New Vision for the Church Today,” a compilation of papers written for the 50th Golden Jubilee Convention of the India MB Church. – 1968. Helen Loewen Warkentin’s copy of “Die Kleine Palme, No. 2.” – 1900. Helen Loewen Warkentin’s copy of “By the Way: Travellogues of Cheer.” -- [192?]. Helen Loewen Warkentin’s copy of “Der Mithelfer.” – [192?]. Helen Loewen Warkentin’s copy of “Centennial Celebration: Women’s Missionary Service Meeting” booklet. – 1960. Helen Loewen Warkentin’s copy of “Harvest Field: March-April.” – 1938. Helen Loewen Warkentin’s book of autographs containing personal notes from multiple individuals. – 1941. Helen Loewen Warkentin’s copy of “Das Neue Testament.” – 1924. Helen Loewen Warkentin’s copy of the “Holy Bible,” presented to her on the eve of her retirement. – 1957. Helen Loewen Warkentin Autograph book with notes and letters from multiple individuals.. – 1928-1929.